For over 30 years, CompuWeigh Corporation has been the leading Weighing Control and Automation Company in the Grain Industry. We are an innovative-driven company providing state-of-the-art bulk weighing scales, computerized weighing control systems, RFID automation systems for trucks & railcars, PLC/HMI facility automation and Enterprise Logistics for tracking rail and barge traffic across the U.S.
CompuWeigh customers include the Top Agricultural producers in the US who use our equipment both nationwide and all over the world. 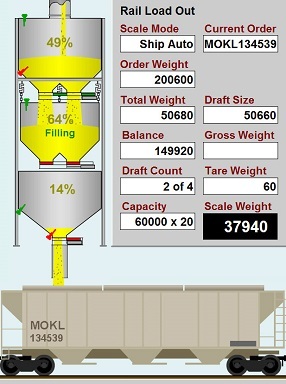 Today, over 70% of all grain weighed in the U.S. is processed through our series of weighing control systems including 90% of all Export Terminals that demand 24/7 reliability. We recognize that our employees are our key asset and reward them appropriately with attractive competitive salaries, excellent benefit packages, generous 401K plans and yearly bonuses based on individual performance and overall company growth. CompuWeigh is committed to equal opportunities in all parts of our business. Our policy is to recruit, train and retain the best people in the industry and customize the job to fit their special skills. Come join the CompuWeigh “A” Team and be a part of a dynamic and innovative software and automation company working with the major Agricultural and Bio-Energy facilities across the country. Our leading edge weighing control systems with RFID technology, PLC/HMI Automation systems and enterprise logistics inventory system for railcar traffic management are employed by the major agricultural producers and bio-fuel companies in the US and abroad. We are developing business applications focused on improving operational efficiency for our customers by combining innovative hardware solutions, process automation and extensive telemetry with user-friendly data management and visualization tools. Develop Line-of-Business Web applications, management dashboards, web-based interfaces for industrial devices and data services. Strong focus on building applications for use in mission-critical environments and integrating them with multiple other systems through network services. Work in an agile Scrum team using the latest tools and techniques (TDD/BDD, unit testing, Dependency Injection, continuous integration). Use HTML/CSS, AJAX, popular Web frameworks, SQL Server and .NET technologies to design sophisticated and visually-compelling web applications. 3-5 years of experience with developing LOB/Enterprise web applications. Proven experience designing interactive Web UI’s or SPA’s for commercial use. Good understanding of the Web design techniques and responsive visual layout. Working knowledge of SQL Server databases and T-SQL language. Ability to setup a web server host (IIS, Apache, NGINX) and deploy web application. Knowledge of .NET/C#, XAML or Xamarin and Visual Studio IDE is a major plus. Experience with Linux, Python, device communication protocols, IoT platforms, MQTT, mobile or cloud development is a plus. Strong knowledge of software implementation best practices and understanding of the role of methodology/frameworks. Experience/knowledge of Scrum methodologies, TDD unit testing, version control, Continuous Integration and delivery. Applicants are expected to be staying abreast with the IT industry and constantly self-educate (e.g. reading technology blogs, posting in forums, attending community events, trying new concepts not directly related to the work assignments). Bachelor’s Degree in Web Design, Computer Science, Information Systems or other related field. Competitive Salary with incentives and bonus plans. We are embarking on the development of a strategic platform to drive the next generation of process control applications for our customers. Develop multi-tier .NET applications and Silverlight-based clients. Strong focus on the device-oriented and process-oriented environment utilizing plug-in architecture and some embedded application development. Work in an agile Scrum team using the latest tools and techniques (TDD/BDD, unit testing, Code Contracts, Dependency Injection etc.) Use SQL Server, Crystal Reports, SSRS and SSIS technologies. Solid understanding of the object-oriented programming (OOP) principles. 3-5 years of experience with the .NET Framework and Visual Studio IDE, C#, ADO.NET, ASP.NET and WCF Web Services. Knowledge of .NET 4.0, Silverlight, XAML and RIA development. Strong experience designing and working with N-Tier architectures (UI, Business Logic Layer, Data Access Layer, ORM). Good working knowledge of SQL Server 2005/2008 – design databases, create and optimize T-SQL stored procedures, experience with SSIS and Reporting Services. Prior experience with Visual FoxPro is a big plus. Experience/knowledge of Agile, TDD, Scrum methodologies, unit testing. Strong ability to work in a customer interfacing environment. On-call duties may be an element of this job. Bachelor’s Degree in Computer Science, Information Systems or other related field. Come join the CompuWeigh “A” Team and be surrounded by 20 beautiful acres in Woodbury, CT.
Our current Support Specialist was just promoted and we are looking for another team oriented individual to provide hardware/software support for our industrial weighing control systems. This person will serve as the primary liaison between the company and customer for technical assistance and problem solving via the telephone. Major responsibilities include diagnosing and answering complex questions on function and usage of our products; troubleshooting, testing and customer follow up. Tracking and maintaining records on all customer issues and making certain that all problems are resolved and all fixes are delivered is vital. Specifically this position entails system configuration/setup, product functionality, testing for bugs and working with our in-house engineers and programmers to resolve any customer issues. PC hardware and software experience is required, networking concepts and protocols, TCP/IP Networking including routers and switches and advanced proficiency in Microsoft products is also required. This position requires an individual who is self-motivated, able to work independently with a “Get It Done” attitude. The candidate must have strong analytical /problem solving skills, excellent verbal and written communications, fluent in English and have the ability to promote and maintain a high quality, professional, service-oriented company image among users.